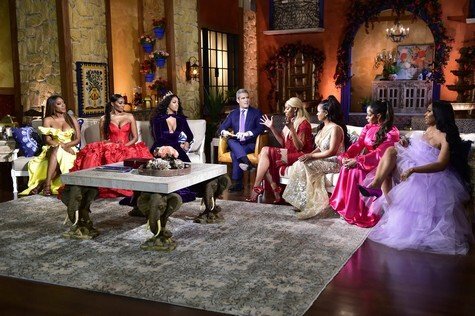 The Real Housewives Of Atlanta reunion was going so well until Kim Zolciak showed up. I mean, people with feuds as old as their suddenly rejuvenated (and impregnated) ovaries were having civil discussions about those times they accused each other of being prostitutes to one-eyed Africans (do neither Porsha Williams nor Kenya Moore STILL not understand that ‘one-eyed’ referred to the African’s “D” – not that he’s an actual cyclops. Now you know Kandi Burruss secretly wrote a “For The D” rap about that…). Then of course with all that peace, love, and Leave Will Alone, Kim Showed up. Now that girl… Kim looked like she was wearing a Jessica Rabbit Halloween costume. And what on earth is Kroy Biermann doing with his life? He needs a Tabatha take over, because he’s apparently so depressed about being released from the NFL that he’s lost all purpose in life. It’s like the dude followed-up on a Craigslist post seeking personal assistant and wound up working for this crazy person who expects him to just follow around carrying her Solo cups and making sure all her outfits match said Solo cups – outfits he also has to pry her into using tweezers. The first part of the Real Housewives Of Atlanta was pretty tame by comparison to what we’ve come to expect. I mean the only things that happened were a pregnancy announcement, blackmail revelation, and your mama jokes. Low-key, right?! The most important thing about any reunion are obviously the outfits. Apparently if you are a Real Housewives Of Atlanta star the reunion is your equivalent of the Academy Awards. But all the stylists are busy and the only gowns left are the ones no one wants to wear. What we really must discuss is Porsha Williams‘s crown. Umm… She’s elevated from Princess of THOTlandia (where one’s crowing achievement is twerking in hot pants) to Queen of Delusion. Although she claims to be the Goddess of Good Thoughts or something – good thoughts except when she’s calling Kandi Burruss “Victim Victoria,” Goddess Of Never Letting Go. In essence, Season 10 of Real Housewives of Atlanta was brought to you in part by Snapchat, or at least that’s what it should say somewhere in the credits of each episode. The video that Kim Zolciak’s daughter Brielle Biermann took of herself in the mirror at NeNe Leakes’ house, changed the course of the season. Kim saved it in her archives and unleashed on NeNe, accusing her having a roach-infested home. 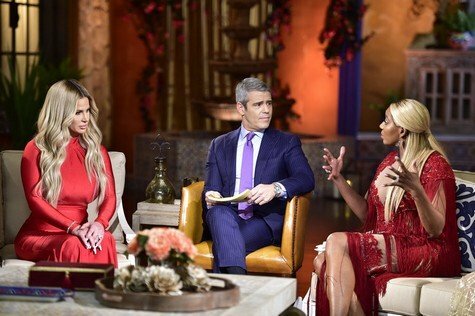 NeNe fired back with accusation of racism aimed at both Kim and Brielle. 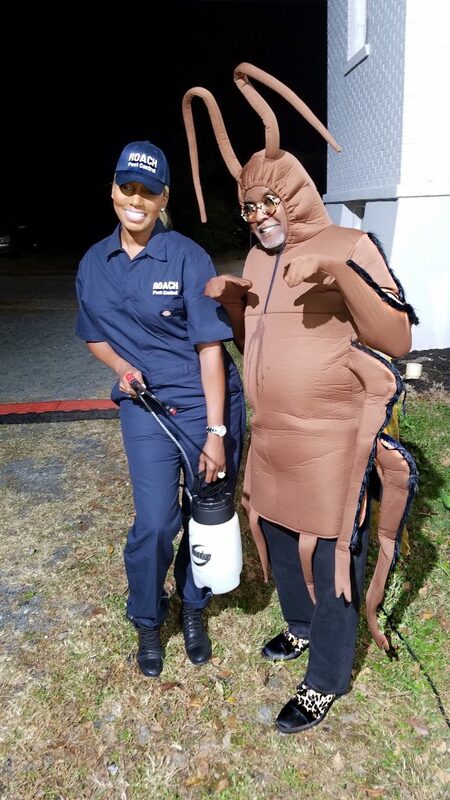 Roachgate took over the season and that’s why I thought it was hysterical when NeNe and her husband Gregg Leakes dressed as an exterminator and roach for their Halloween costumes. I laughed, Kim’s girl Sheree Whitfield even laughed, but Kim did not find it funny. At all. This week in reality star photos we have Dr. Terry Dubrow and former Real Housewives of Orange County star Heather Dubrow attending the Alliance For Children’s Rights 26th Annual Dinner at The Beverly Hilton Hotel. Erika Jayne signed copies of her new book “Pretty Mess” at Barnes & Noble at The Grove in Los Angeles. Several Bravolebrities stopped by the SiriusXM studios, including Real Housewives of Potomac stars Karen Huger and Gizelle Bryant and Vanderpump Rules star Kristen Doute. The cast of Jersey Shore hit the red carpet together for the premiere of “Jersey Shore: Family Vacation”. The show premieres on MTV tonight! Are you tuning in? 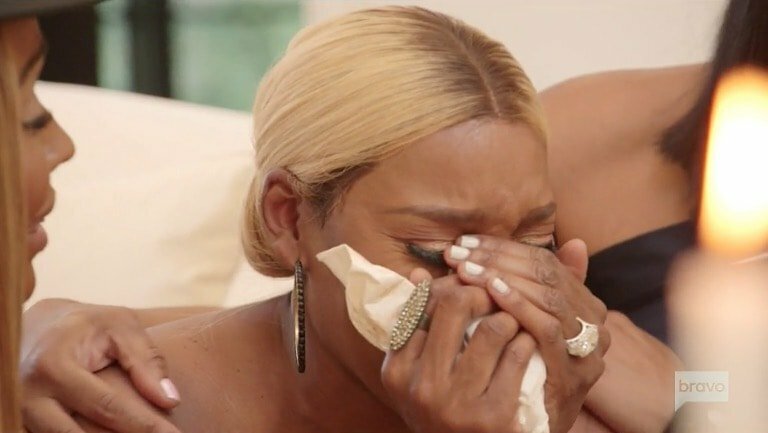 On last night’s season finale of Real Housewives Of Atlanta it’s as if someone decided to finally give Sheree Whitfield something to do besides accept collect calls from her incarcerated boyfriend. I mean something has to pay for that basement – might as well be Bravo checks instead of wherever ‘Lie-rone’ is collecting his income! Out of the blue Sheree is incredibly pressed about Porsha Williams supposedly warning Shamea Morton that none of the women can be trusted – including Sheree. Poor Sheree – she’s been carrying everyone’s bones while having Porsha’s back, and is repaid by Porsha dismissing their friendship. Now Sheree has a bone to pick with Porsha – except she’s passive aggressively avoiding her by hiding in her basement staring at the abyss of Moore Manor. Why would Shamea, Porsha’s so-called BFF, be sharing her text message with Desperee?! Hmmm… We never get an answer to that by the way. Real Housewives Of Atlanta Recap: Mr. Right Finally Arrives? Well, well – Kenya Moore‘s husband is no more Question Marc! We finally saw Marc Daly in the flesh on last night’s Real Housewives Of Atlanta, but he’s still leaving me with questions about his cardboard affect. 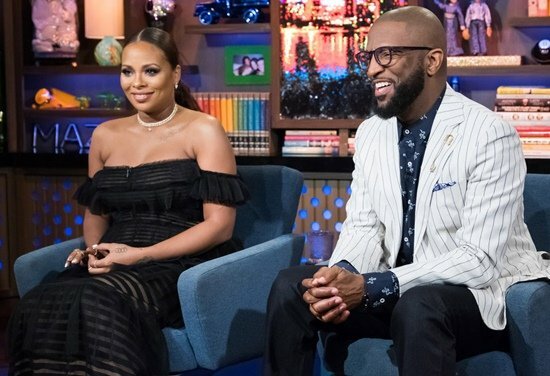 I never suspected Kenya had faked her marriage, but like NeNe Leakes alluded I always assumed Kenya was much more in love with Marc than he is with her. Just based purely on how Kenya describes him and their relationship gives me the willies actually! And seeing Marc, mingling around last night, something seemed … off. It wasn’t just camera jitters or nerves about what the women (and show) may have in store for him, it was an animosity. Dude, you married a woman on a TV show, you knew what you were getting into! NeNe Leakes was on top of the world, but on last night’s Real Housewives Of Atlanta it all came tumbling down. Can NeNe ever be put back together again after her great fall? NeNe is officially in a twitter war (and every other kind of war) with Kim Zolciak and Brielle Biermann. It’s gone beyond nasty into libel territory and Orkin definitely needs to exterminate this mess. It’s actually making me think less of two women, whom I’ve never managed to muster a decent opinion of in the first place. This is the magic of Bravo: nasty people behaving more badly. You can read all the details here. Aside from her (seemingly) controlling ex-husband, Porsha Williams has not had a legitimate love interest on Real Housewives of Atlanta. Sure, we’ve been subjected to viewing some failed dates and some faux relationships, but nothing that felt like more than a story line. Nevertheless, a lot of people are really pushing for Porsha to get together her Dish Nation coworker Rickey Smiley.